The main contaminant which needs regular control on asphalt sports surfaces is moss. If left unchecked this can develop in a short space of time to a point where it can be dangerous to play on such a surface. To treat an infected area effectively it must firstly be sprayed with a proprietary brand of moss killer. This can be applied using tractor mounted sprayers, walk-overs & knapsacks at any time of the year providing conditions are moist. 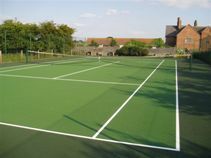 The surface must be left for 2-3 weeks for the treatment to become effective then the whole area can be cleaned using the Hydro Mechanical system developed by Sweepfast Ltd. A regular treatment programme with a moss control chemical & regular cleaning with a Cleansweep should help prevent re-contamination. Using this unique system developed by Sweepfast, moss and biological contamination is removed from the surface and brushed away to be collected and disposed of. Once clean the surface is ready for play once more. If however the existing paint is fading or simply flaking off it can be re coated with a slip resistant paint to fully restore the surface to its former glory.